A new chapter of our guide to connecting Magento 2 to Oracle NetSuite ERP is finally here. Today, we explore such a huge part of the system as Lists. Being a new chapter of the ‘Exploring Magento 2 Oracle NetSuite ERP Integration’ series, this article sheds light on how the section is designed and how to manage it. Besides, we shed light on how to synchronize the corresponding data with your Magento 2 website. Let’s take a look at Oracle NetSuite Lists, explore the backend, and then synchronize the flow of Lists between Magento 2 and Oracle NetSuite ERP. 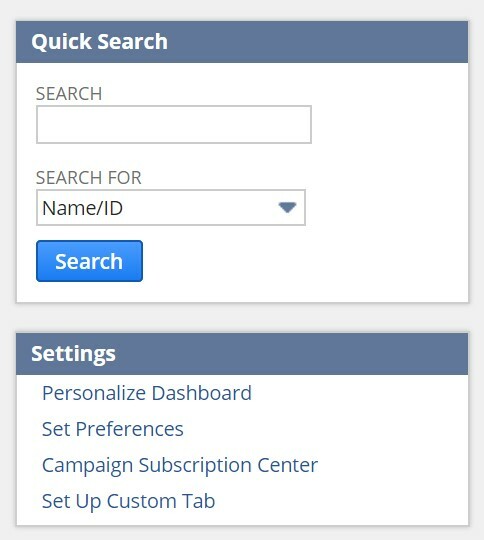 Hover over the Lists tab to see the available options. 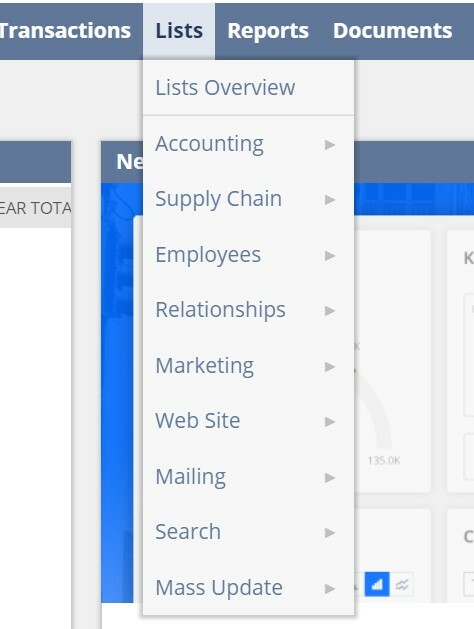 As a NetSuite ERP user, you can proceed to the Lists Overview, or explore each group of lists individually. The following options are under your disposal: Accounting, Supply Chain, Employees, Relationships, Marketing, Web Site, Mailing, Search, and Mass Update. In Accounting, you can manage Accounts, Items, Units Of Measure, Shipping Items, and Quantity Pricing Schedules. The system lets you add new items or search for existing ones. 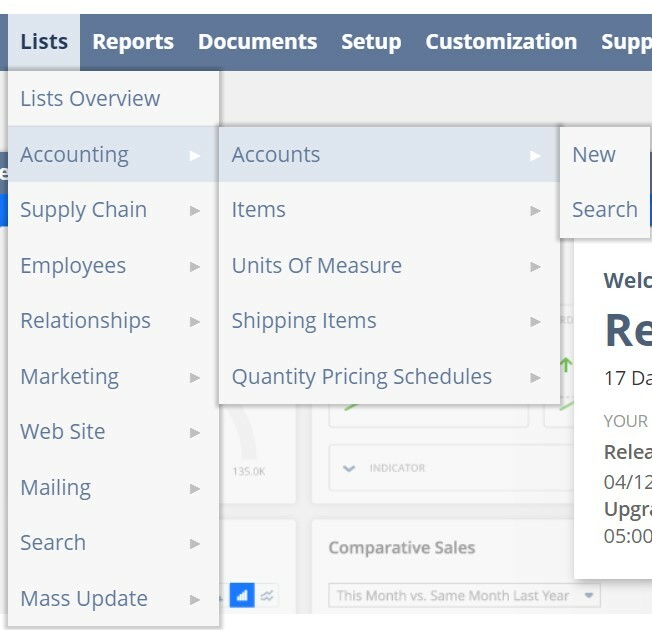 In Supply Chain, you can manage Item Revisions. 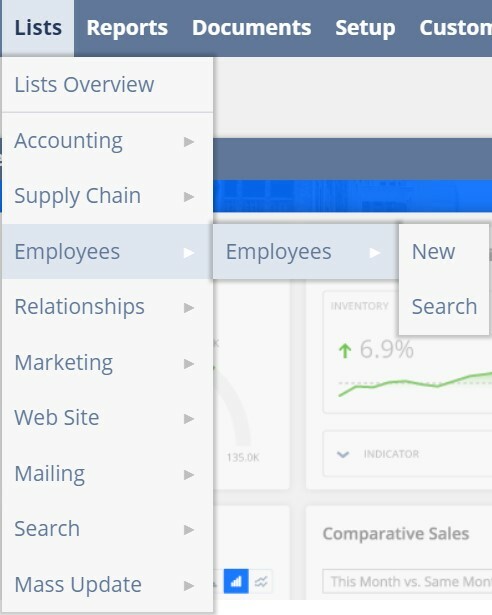 Next, NetSuite provides the ability to manage employees. Note that you can synchronize them between Magento 2 and Oracle using the solution described below. 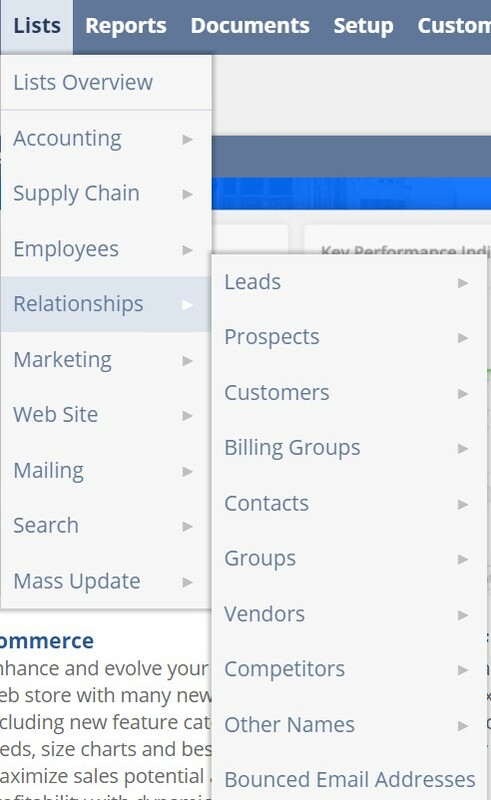 Under Relationships, the system offers such sections as Leads, Prospects, Customers, Billing Groups, Contacts, Groups, Vendors, Competitors, Other Names, and Bounced Email Addresses. And you can freely sync all the corresponding items between Magento 2 and Oracle NetSuite ERP. 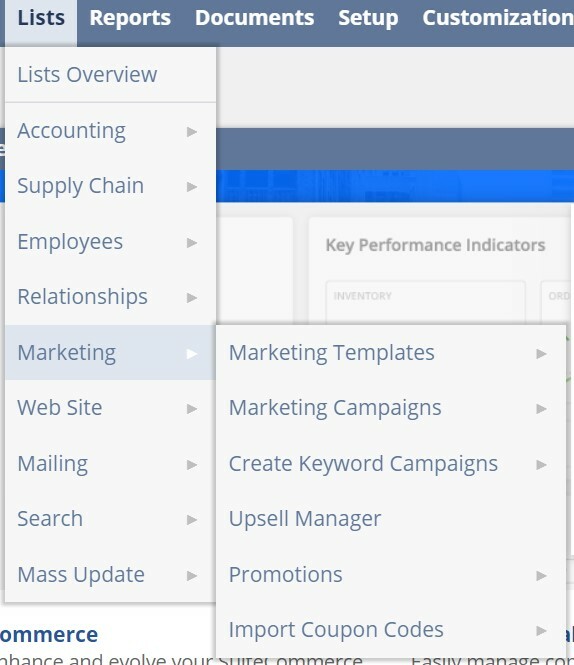 As for the Marketing section, it is designed to provide access to Marketing Templates, Marketing Campaign, Upsell Manager, Promotions, and Import Coupon Codes. 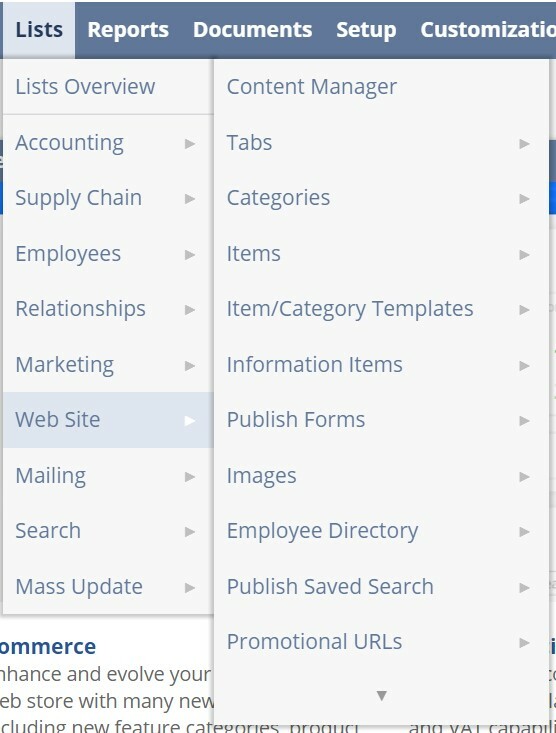 The Web Site section leads to Content Manager, Tabs, Categories, Items, Item/Category Templates, Information Items, Publish Forms, Images, Employee Directory, Publish Saved Search, Promotional URLs, Bulk Set URL Components, Customize Text, and RSS Feeds. 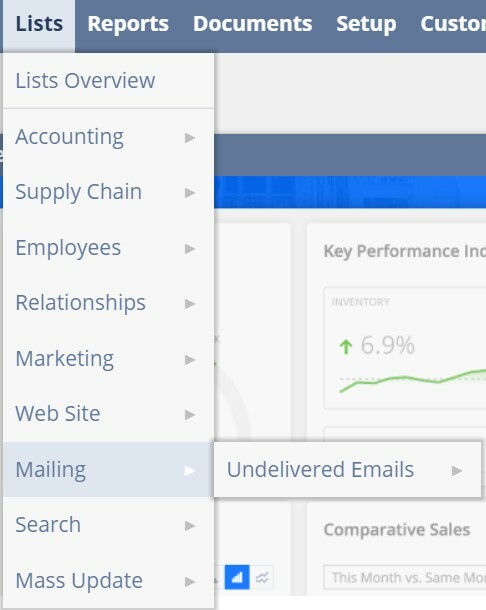 Under Mailing, you can discover Undelivered Emails. We will describe how to synchronize data from all these sections with Magento 2 soon. 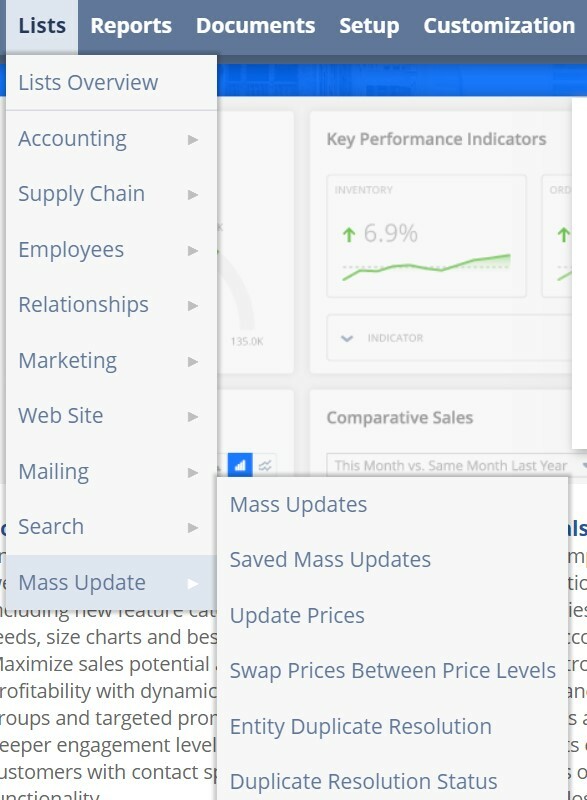 Now, let’s explore the Lists Overview section. In this section, you will find all recent records, lists of links described above, and the Custom Search field. Feel free to personalize this page and change its layout. Scroll down for Quick Search and Settings. Next, you can explore each grid individually. They are quite similar. For instance, you can see a grid with customers below. It is possible to print the grid as well as download it as CSV, Excel, or PDF files. You no longer have to do that, since there is a solution that lets you transfer all this data from Oracle NetSuite ERP to Magento 2 directly, but let’s take a look at other interface elements before discussing the integration. 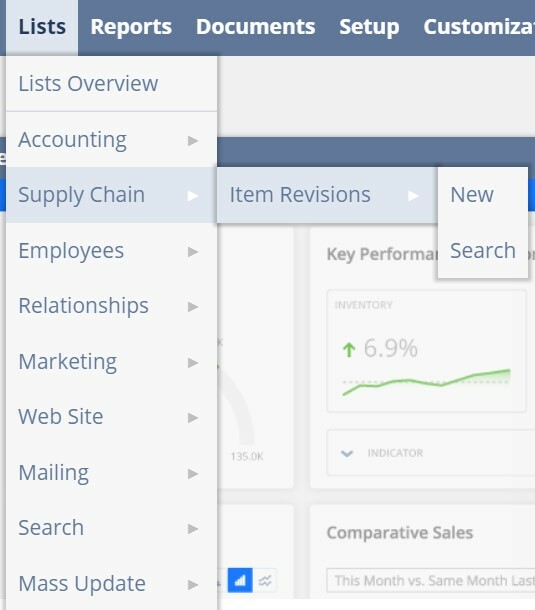 The interface of Oracle NetSuite ERP is intuitive and user-friendly. Therefore, we don’t want to bother you by describing other elements of the Lists tab. Since they look similar, you can explore them on your own to know more about the platform. Now, we’d like to draw your attention to the Magento 2 Oracle NetSuite integration in terms of transferring ALL Lists between the two systems. The following part of the article describes how to move Leads, Prospects, Customers, Billing Groups, Contacts, Groups, Vendors, Competitors, Categories, Items, Item/Category Templates, Information Items, Publish Forms, Images, Employee Directory, Publish Saved Search, Promotional URLs, etc. To synchronize the exchange of Lists between Magento 2 and Oracle NetSuite, you need to utilize a third-party extension. Although there are many third-party import/export solutions, there is the only one that enables the entire integration between Magento 2 and NetSuite. It is the Improved Import & Export extension – a tool that completely replaces the default tools that are useless in this situation. The module lets you leverage APIs connections which are perfect for establishing a data flow between the two platforms. All work starts in your Magento 2 admin. Go there and create a new import job under System -> Improved Import / Export -> Import Jobs. When all separators are specified, go to Import Source and choose an import file type there. The Improved Import & Export extension lets you streamline either XML or JSON. As for an import source, you can use REST or SOAP. Configure other parameters and proceed to the data file validation. Finally, you can apply mapping to match attributes utilized in NetSuite to ones used in Magento 2. Thus, you will enable the import of Lists from the ERP system to your e-commerce store. When the import job is configured and enabled, it is necessary to create a corresponding export job. Thus, you will provide NetSuite with the Magento 2 data necessary for Lists. The procedure is quite similar to the one we’ve just described, so you will easily manage it without any further guidance. 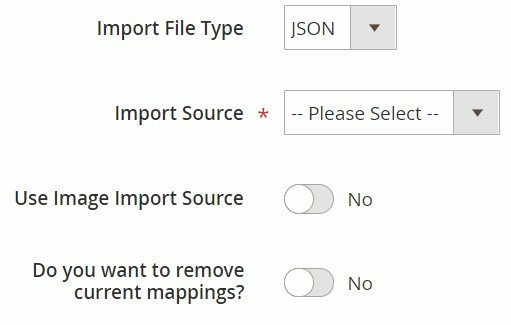 Don’t forget to create import/export jobs for all Lists entities that should be transferred during the Magento 2 NetSuite integration. For further information, contact our support here: Firebear Help Center. We will help you with transferring all Lists between the two systems. Now, we’d like to draw your attention to the features of the Improved Import & Export extension that simplify the Magento 2 Oracle NetSuite ERP integration in more detail. With our module, you can completely avoid the default import and export functionality of the platform which not only prevents the integration but forces you to face many inconveniences related to daily duties. To avoid them and enable multiple new possibilities, the module lets you transfer any information between Oracle NetSuite ERP and Magento 2 including Lists in a very friendly manner. Also, note that the Improved Import & Export extension lets you match different external attributes and their values to ones used internally. Besides, it supports multiple file formats necessary for other integrations, as well as enables you to transfer all entities. What is the most important thing when it comes to the integration of Magento 2 and NetSuite? Right, it is automation of data transfers. Being a mandatory requirement when you synchronize Magento 2 with external systems, it dramatically simplifies all integrations. As a result, you can save a lot of time spending it on more vital processes. The Improved Import & Export extension lets you achieve this goal in two different ways: via schedules and event-based triggers. Choose schedules, and you will get the most intuitive and straightforward way of automating data transfers. The transfers of NetSuite Lists between Magento 2 and Oracle can be much easier than you could even imagine. 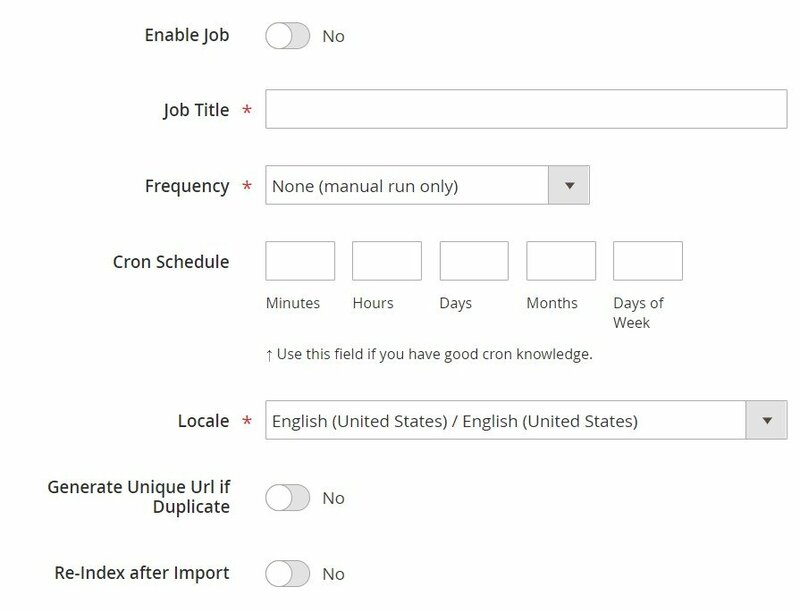 Since schedules are based on cron, they allow you to develop fully independent import and export jobs that enable the connection between your e-commerce store and Oracle NetSuite ERP. Then, you should combine an action with a trigger to launch it automatically. For instance, a new customer creates an account on your e-commerce store. This action can be connected to a trigger the launches customer data export to NetSuite. Thus, you synchronize the two platforms when new data is added to the system – not when the time has come. Thus, transferring Lists data to Oracle NetSuite ERP and importing the corresponding output back can be based on both specific events or selected time intervals. Follow the link below for more information about the feature: How to Run Magento 2 Import or Export After Specific System Event or Process. If data from an external system contains third-party attributes, you cannot import it into Magento 2. And Oracle NetSuite ERP is not an exception. But the Improved Import & Export extension solves this problem in multiple ways. It provides the ability to map all third-party designations to ones used in Magento 2. As a result, you can automate the transfer of Lists. Our module lets you solve the problem of different attribute standards without headaches and synchronize the transfer of Lists data between Magento 2 and Oracle NetSuite ERP with mapping presets – predefined mapping schemes that eliminate manual attributes matching. 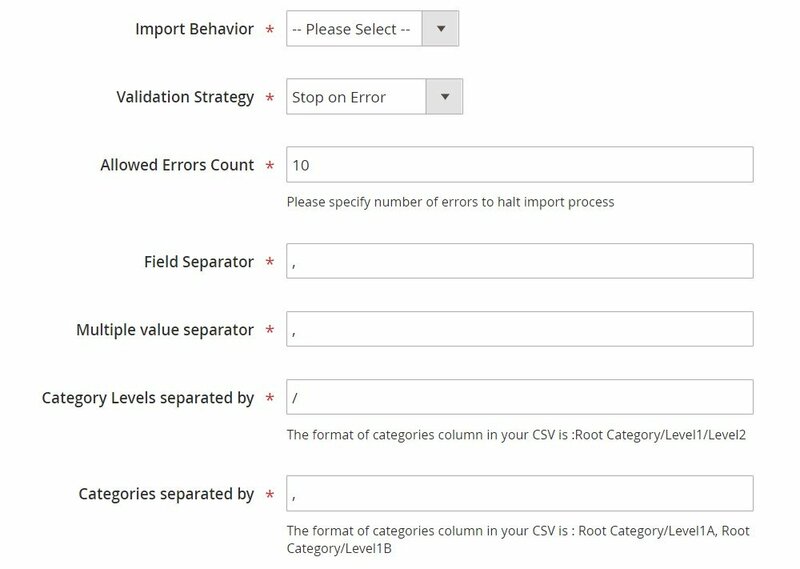 As for the “Default Value” column, it plays an important role in attributes matching when you transfer any data from Oracle NetSuite ERP including Lists. Being designed for values, which are provided to all items of a corresponding attribute automatically, it replaces the old ones within a few clicks. Export mapping is possible as well when you transfer Lists from Magento 2 to Oracle NetSuite. If you want to provide Oracle with data modified according to specific requirements, map native Magento 2 designations to them creating fully suitable output. Attribute values can be mapped as well when you transfer Lists data between Magento 2 and Oracle NetSuite. 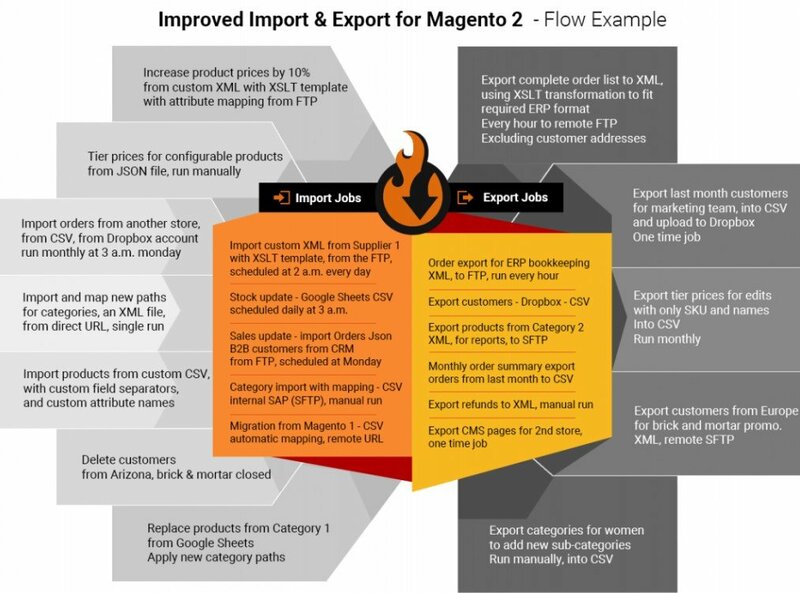 The Improved Import & Export Magento 2 extension offers a separate interface to simplify the Magento 2 Oracle NetSuite ERP integration and Lists synchronization. External designations will no longer interrupt the transfer since you can choose an external value from Oracle NetSuite ERP and specify the internal one from Magento 2 as its replacement. Repeat the procedure until all third-party designations are mapped to ones utilized in the new one and Lists data is suitable for the transfer. Note that the created mapping schemes are saved and applied for further updates automatically. You can find more details about the feature here: Attribute Values Mapping. It is even possible to create new categories in the import job. Choose a parent category and specify a new one to enable the extension to link products to it during the import. You can find more information in this article: Category Mapping. As for the extended connectivity options, they improve all data transfers between your e-commerce website and external systems as well as enable the Magento 2 Oracle NetSuite ERP integration and the transfers of Lists data. Improved Import & Export provides the ability to leverage new file formats and two alternative ways of transferring information. Our plugin supports data transfer on the basis of CSV, XML, JSON, ODS, and Excel files, which can be provided as compressed archives. The Improved Import & Export knows how to unpack them automatically while the default tools are useless since they work with uncompressed CSVs only! As a result, you can eliminate multiple procedures including archives unpacking and data converting into CSV. Alternative ways of import and export are not represented in Magento 2 at all. Since you are limited by the use of CSV files only, it is not possible to integrate Magento 2 with NetSuite. Consequently, transferring Lists becomes a quite problematic procedure. But Improved Import & Export is a real game-changer. It supports direct API connections and intermediary services enabling multiple new possibilities. 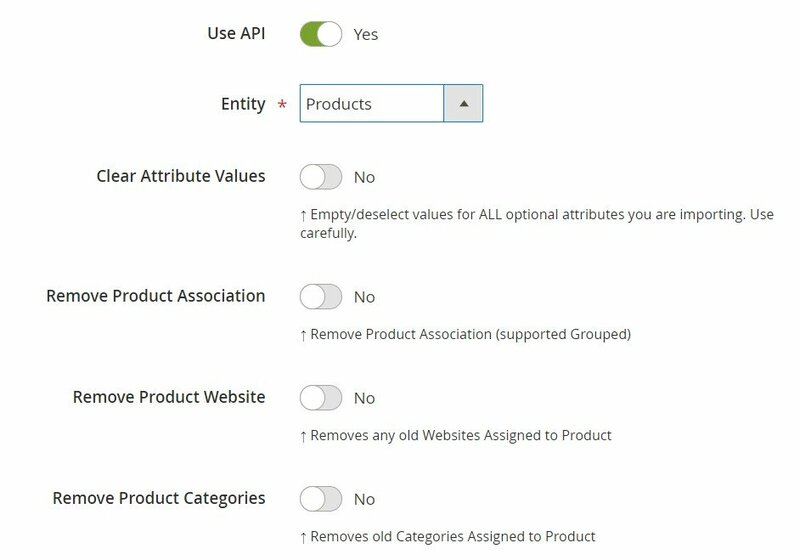 To connect Magento 2 to Oracle NetSuite ERP and import/export Lists data, the Improved Import & Export extension provides the ability to leverage APIs. Our module supports REST, SOAP, and GraphQL. All API connections are fully compatible with the extension’s features, so you can streamline mapping, schedules, and attributes on the fly, entirely automating the integration. Our third exploration of Oracle NetSuite (read the previous two articles here and here) shows that even such a huge system can be not as complicated as you might have thought when visited it for the first time. Despite its powerful features and multiple interfaces, it is designed with end users in mind. Therefore, you can master it without any serious efforts.